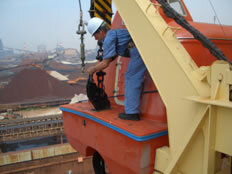 Fuji Trading Co. Ltd. is a leading marine service provider operating across the globe in almost every continent. Established in Kobe in 1953, Fuji Trading Co. Ltd. has expanded its strategic supply bases from Japan to locations around the world including: Rotterdam, London, Dubai, Qatar, Newport News (Virginia), Baltimore (Maryland USA), Singapore, Busan (Korea), Hong Kong, Shanghai and Shenzhen (China). Fuji Trading is an innovative, industry leading service provider that is dedicated to the single aim of providing exceptional customer services and quality products. In accordance with SOLAS Amendment Chapter III, Reg.20 (following IMO Guidelines), all ships have to receive annual and 5-year inspections of lifeboat and lifeboat davit by inspectors authorized by manufacturers from July 2006. For details, please refer to "IMO MSC/Circ.1093 (Guidlines for Periodic Servicing and Maintenance of Lifeboats, Launching Appliances and On-Load Relase Gear)" and "IMO MSC.1/Circ.1206 (Measures to Prevent Accidents with Lifeboats)".